Today's post is going to be completely different from my typical content, but one that I love reading on other blogs. What I eat in a day. 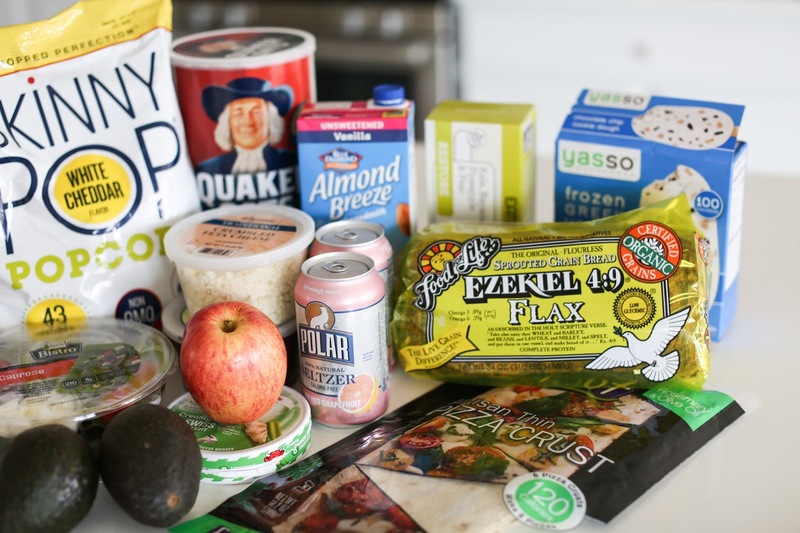 This won't be a food diary per se but a look into many of the meals and food choices I make each day. I believe in being as real as possible in my posts, so I will be honest and say I am not a fan of cooking. Never have been and while I'm slowly learning, I still don't really enjoy it. That being said, many of the things I feature today are pre-made, frozen or packaged because I can only bring myself to cook maybe one night a week (trying to make it more but ugh, it's not my favorite activity). My overall diet approach is quite balanced and healthy while allowing myself regular splurges. 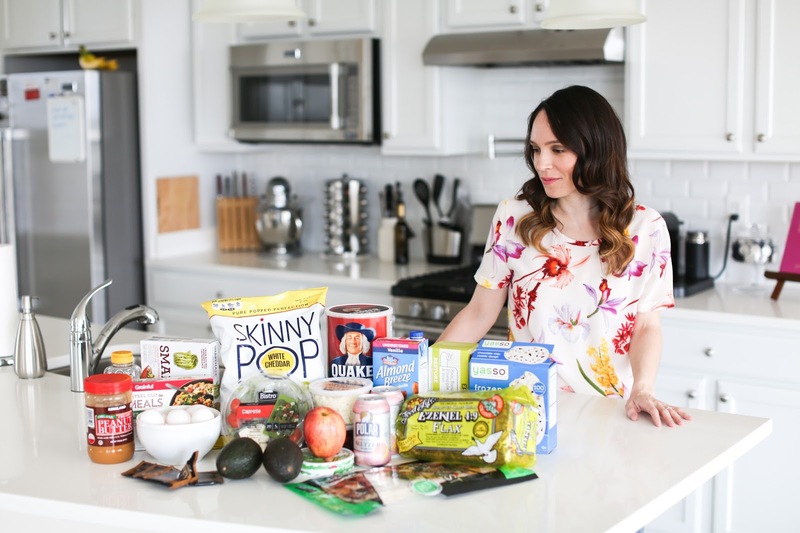 I have never tried a specific eating plan (Whole30, Paleo, Atkins, gluten-free etc), and if I am being completely honest, eating well 85%-90% of the time for years and years has always allowed me to avoid them. Many of those eating plans can be quite rigid especially in the first few days/weeks that I know it would have the opposite effect on me. I would end up obsessing over all the bad food I couldn't have and would feel so deprived that I more than likely would quit immediately or sabotage the plan. I don't think this is the case for everyone as I know many people that are successful on these plans or need to stick to them for health reasons, but for me it's not an option. I am quite disciplined so when I splurge, I can easily get back on track the next day or even the next meal. This way of eating allows me to never feel deprived, but still enables me to maintain a healthy weight and have enough energy to do all the things I want to do. 1. Oatmeal - I typically make myself a bowl of oatmeal, spread on a spoonful of peanut butter (I prefer ones that contain peanuts as their only ingredients - I don't want the extra sugar) and a drizzle of honey. This is my longest lasting breakfast out of anything I have ever tried. I do not crash mid-morning and can stay full until lunch. 2. Eggs and Avocado Toast - Oatmeal is my long distance meal, but when I want to change it up I will make myself eggs. This option unfortunately doesn't keep me full as long as the oatmeal so I eat it on days that I know I can have an early lunch. I scramble one egg and two egg whites together, occasionally add a sprinkle of shredded cheese, and serve it with half an avocado mashed up on a slice of Ezekiel bread. This may sound annoying and almost unbelievable, but it's true. I eat a salad almost every single day for lunch. I would say that I stray from this maybe 5-10 days in a whole year! I KNOW, it's crazy! But hear me out....when I worked a desk job for many years, I would try other options for lunch - but anything that was carb heavy or too rich would have me asleep by 3pm. I would feel so lethargic and dizzy that I would sometimes have to leave work early. I decided to start eating a salad for lunch (my favorite place to go in NYC is Chop't) and it was amazing how I never lost energy, felt more alert the second half of the day and stayed full until dinner. So I stick with what works because the benefits of feeling great for the rest of the day are worth it for me (no matter how badly I would sometimes prefer a huge sandwich instead lol). 1. 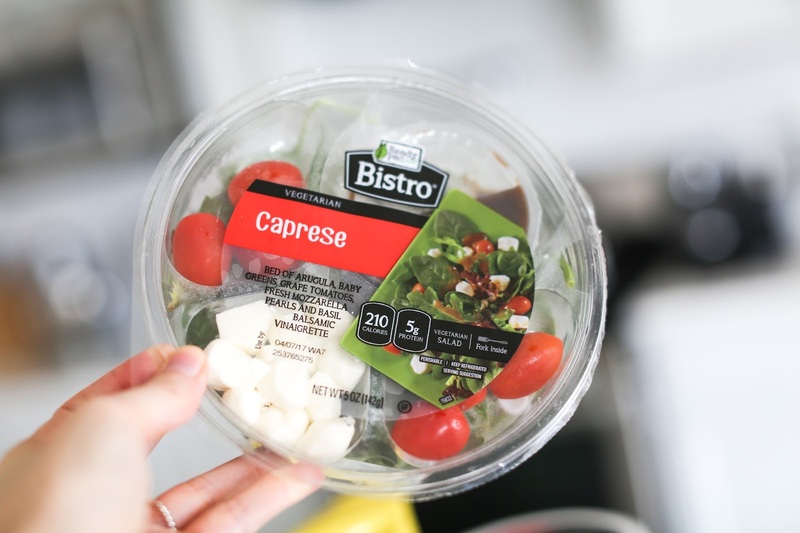 Pre-made salads - If I am not going out to Chop't or another lunch place to grab a salad, I like the pre-made ones from places like Wegmans and Trader Joes. 2. Homemade salads - Recently I have been on a kick making myself a greek salad for lunch each day and am loving it! I combine romaine lettuce, cucumbers, olives, tomatoes and feta cheese in a bowl and toss in my own dressing (a small drizzle of olive oil, one lemon, salt and pepper). 3. Salads when eating out - Depending on where I go, I may change things up but here is a list of the main ingredients I rotate in my salads: romaine or kale, carrots, celery, beans (chickpeas/edamame/black beans), onions, peppers, cheese (preference is mozzarella, feta or parmesan) and avocado. Occasionally if available I will opt for shrimp or grilled chicken on top. I rarely get dressing but prefer olive oil and lemon. I mentioned above that I don't like to cook. I can make things here and there, but I really don't enjoy it. When I lived in NYC, I would get delivery almost every night, but now that is no longer an option so I am slowly testing the waters with a few dishes. I'm hoping with time I will come to enjoy cooking a bit more, but for now I will share what I currently eat most nights. 1. Frozen Dinners - Yup, I really do live on these. I told you this post was going to be honest. Now that being said, I look for ones that are healthier and more balanced. I've been pleasantly surprised with how many great options are available now. The two I am showing above are the brands I regularly have in my refrigerator and eat often. 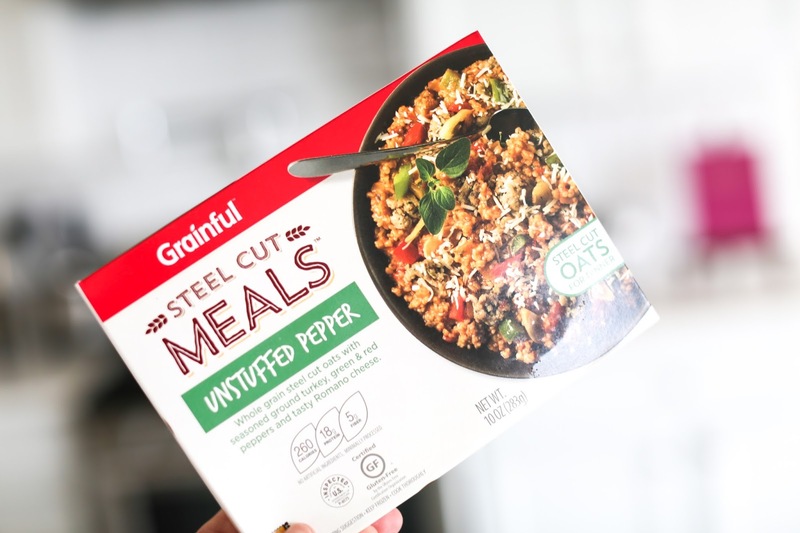 I was hesitant at first to try the Grainfuls (oatmeal in place of rice or pasta - yuck), but it has really grown on me and I am obsessed with these now! 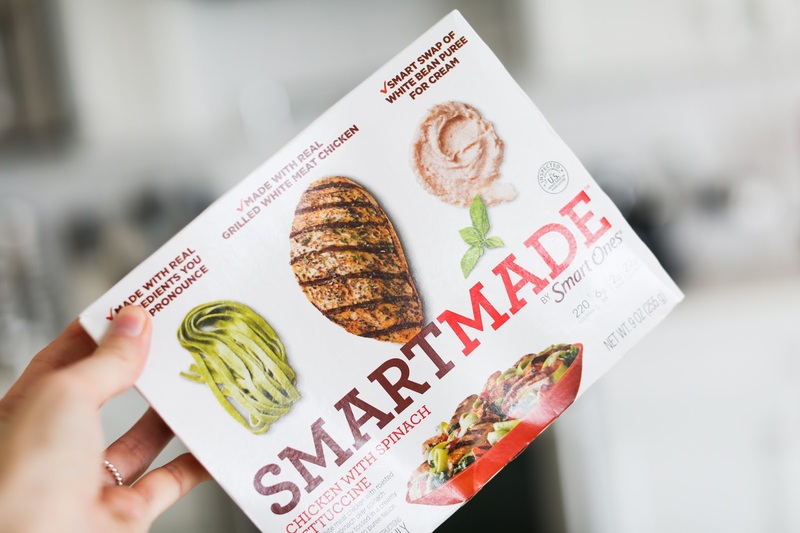 The Smartmade meals were a recent find and I really enjoy how simple and uncomplicated the meals are with limited ingredients. 2. Flatbread pizzas - So one of my attempts at "cooking" was making my own flatbread pizzas. I found thin flatbreads at Wegmans (the exact one is shown in the second picture from the top) and add a spoonful of tomato sauce, fresh slices of mozzarella cheese, tomatoes and fresh basil. One flatbread normally lasts me two days. 3. Cauliflower rice or zoodles - Yes, I did fall victim to all the buzz surrounding cauliflower rice and zoodles but find them so easy to prepare! With caulifower rice, I sautee it with a bit of tomato sauce and add grated cheese at the end. I combine it with my Trader Joe's turkey meatballs for a pasta and meatballs style dish. With zoodles, I sautee them with olive oil and add lemon at the end. I will normally have this alongside any protein I have lying around - turkey meatballs, grilled chicken strips, shrimp, etc. 4. New dinner recipe - I recently discovered this dish and have been eating it non-stop so I felt it was worth mentioning here. I am not a huge snacker, but I have a few things on hand for when I get hungry during the day. Dessert however is my major weakness and I will never go a day without dessert. There are some days that I do a major dessert splurge, but most days I have a few different things I treat myself to that aren't too much of a calorie bust. 1. 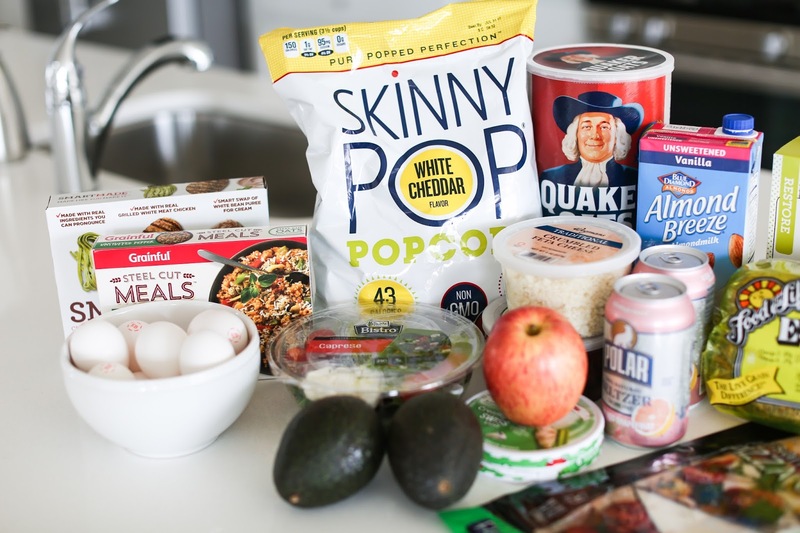 Snacks - I know I am late to the game on this one, but I just discovered Skinnypop and can't get enough! I also love a piece of String Cheese or Cheese Wedges from The Laughing Cow. I am not a huge fruit person, but when I am in the mood for something I like to have apples on hand. They are quick, easy and portable. I know tea is not a snack but I drink a ton of it! Peppermint or Mint is my favorite and I add a bit of almond milk. 2. 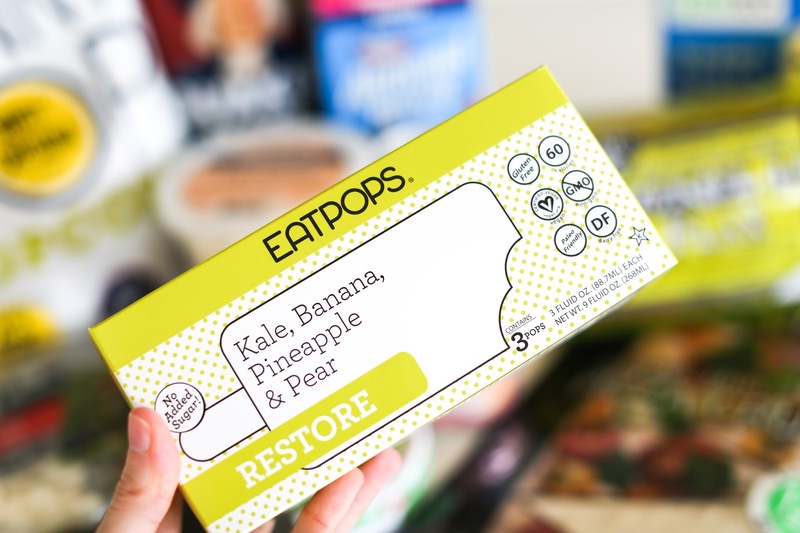 Desserts - I stumbled upon these Eatpops (in above picture) recently and have been loving these at night when I want something refreshing. Yasso Frozen Yogurt Pops are another great frozen treat that have a ton of protein. I also love York Peppermint patties as a low calorie chocolate treat. I have a huge weakness for marshmallow Peeps and buy whatever seasonal version is out at the moment. While they obviously are high in sugar, 5 of them equates to only 140 calories so it's not a huge dent on the waistline but satisfies my sweet tooth immediately. I hope you enjoyed today's post as much as I enjoyed writing it! I LOVE to eat (love, love, love) and struggled for many years trying to find a balance between enjoying food yet still remaining healthy. 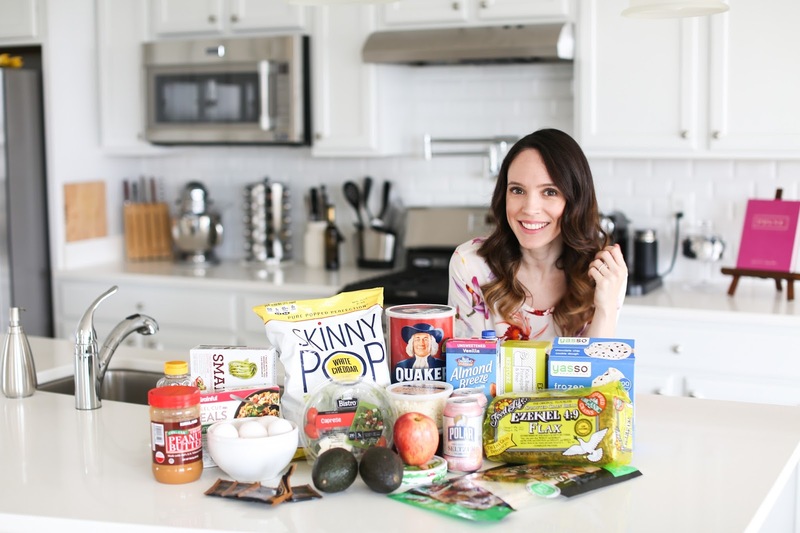 After so many years of not understanding the foods that worked for me and how to balance them with the splurge foods, I finally have gotten a better handle on it and have never felt healthier! Let me know if you have any favorite recipes I should try (as a newbie) or some of your favorite foods you eat regularly. Comment below!